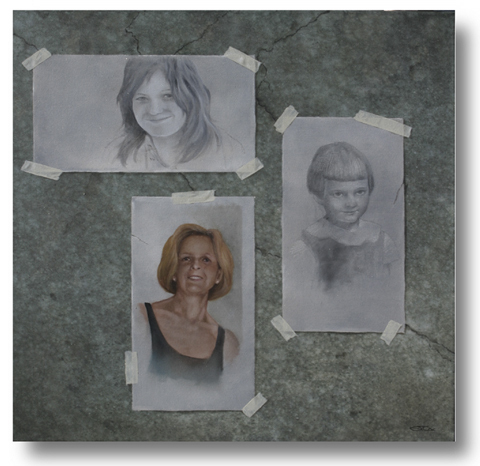 I combined the three portraits as if they were individual pieces taped to a rustic stone wall. I got a chance to play with trompe l'oeil effects and show my painting stages- sketching, black and white oil study then full color oil study. These technical stages also mimic the developmental stages of a person, too. me with the concept of such a peculiar portrait. Ohhhhh...so this would be a jpeg of a photo of a painting of a sketch of a study of an oil of some photos. You know, I don't think I've ever seen the 3 ages of a person in one painting before. You could be on to something. Not to be a negative Nancy, but this is the same style you have used in the past for an awful lot of different things. It's also just the same three pictures re-arranged. What's the difference between doing this and putting them in a three-photo frame? You are in a rut, Mr. Cox and need some inspiration. Thanks for expressing your thoughts, sir. I just got a kick out of doing work that was so applicable to a triple portrait. Yes, I've maintained a certain theme in my work and I intend to keep exploring the depths of realistic painting. Everyone's an 'art critic'. You should hear the jibes I've had to suffer over my 4 "Elvis on velvet under blacklight paintings". While it's antithetical to much of your work, I like the way you minimized the effect of that ridiculous "lift & squish" cleavage sling in your painting as compared to the photograph. Terwiliger: That was a good one. I appreciate this site not just for Johns art but for the general good nature of the posters. Mr. Cox, I'm an artist myself and do not think that I am any better than you are. It did not appear that I offended you, so I am not trying to sound defensive. I do assume, though, that when you post your work for commentary you are looking for creative criticism so I gave a little. It's the same reason I don't play pool against people I know I can beat. You don't get any better that way. You made a good point and I wanted to let you know I take no umbrage when a commenter makes a personal, HONEST point. I would suggest that this "rut" of which you speak is a bit vague. As an artist, you must know that focusing on a particular interest is no shortcut or narrow approach to one's thought process. In fact, I believe pursuing a visual theme opens up all kinds of possibilities. I'd like to hear from any other artist out there about this matter of repetition in a body of work. When is it an obstacle to the creative process and when is it liberating? Thanks for making yourself clear. Picasso was also in a rut with whole Cubism thing. And Sargent with those endless portraits. Rubens and his fleshy women. Now that I think about it Art is one big rut. Life is one big rut. You either get out there & live it--give it your best shot--knowing that just about everything is highly repetitive & derivative by nature--or you throw in the towel & become a loyal subject of somebody who has more gumption than you do. If you keep working at it & you keep your eyes open, you might come across something a little bit different & make some small impact on the world. If you're a loyal subject in a society that affords you many freedoms (including speech) yet makes no demands on you in terms of responsibility, you live comfortably & securely on your daily rations (like Cowboy's dog)--& you might even ridicule those who labor on--until you see somebody who persevered through the drudgery & made a little something for themselves, & then you stake a concocted "claim" to the fruits of their labor in the name of egalitarianism. That little screed wasn't directed at you--it's more of a tangent. However, your [hopefully] constructive criticism butted up with the responses that followed, & I integrated your point with the ideas in the responses that followed to flex my rhetorical muscles a little bit. Terwiliger: I wouldn't know where to begin on that one. Mr. Cox: I think, perhaps, I was projecting a bit with the "rut" comment. I find myself repeating themes sometimes, even when I don't find they fit as well as they should. It's a pattern I try and break so that I don't use a particular look or style just because I know I can. It can be a particular problem when you have a deadline, such as a commissioned work like this one. Rather do it in a way I know will work out acceptably than take the risk. I did a similar portrait of someone a little while back (which I unfortunately no longer have) and was VERY tempted to use a similar composition just because it seemed obvious. I went in an entirely different direction with it and was a lot more pleased wit the outcome. Like I said, maybe it was projection. Thankyou for this marvellous post, I am glad I discovered this website on yahoo. Thanks for all the information. On a side notice, how do you cope with all of the spam you get in your weblog? My new weblog is getting destroyed by random spammers and I have been spending a number of time and energy deleting comments its simply not funny. . I get so drained combating spam that I feed I should cease operating a weblog entirely. I intended to post you this tiny observation to thank you over again on the breathtaking advice you have shown at this time. It was quite surprisingly generous with people like you to give unreservedly precisely what many of us would have supplied for an ebook to end up making some dough for their own end, most importantly now that you could have done it if you ever decided. These techniques likewise acted to be a good way to know that the rest have similar keenness the same as my personal own to know whole lot more in respect of this condition. I'm certain there are some more pleasurable occasions ahead for individuals who looked at your website. Great – I should certainly pronounce, impressed with your website. I had no trouble navigating through all the tabs and related info ended up being truly easy to do to access. I recently found what I hoped for before you know it at all. Quite unusual. Is likely to appreciate it for those who add forums or something, site theme . a tones way for your customer to communicate. Excellent task.. I absolutely love your blog and find a lot of your post's to be just what I'm looking for. Does one offer guest writers to write content for you? I wouldn't mind writing a post or elaborating on many of the subjects you write about here. Again, awesome blog! I see why post... Some other meticulously similar pages on this site? I liked reading your blog, thanks for posting this kind of beneficial content. This page contains a single entry from the blog posted on January 5, 2010 4:06 PM. The next post in this blog is An interesting commission.